Please note that there are so many other nutritional aspects to sports drinks that my recipe does not take into account (like types of sugars and electrolytes). I do not have the resources to research or test these aspects of my beverage. However, clinical testing of consistent intake of this drink or a modification of this drink alongside stool testing could shed light on the effectiveness on this and other possible combinations of homemade probiotic sports drinks. This recipe is amazing for recovery from high intensity training and muscle building. It can also apply for a variety of needs such as: GI health, skin health, detoxification and fatigue. It has helps me with these health needs and it has saved me money from purchasing a variety of different supplements. It puts a lot of different nutrients that I benefit from in one beverage that I can consume once or twice a day with little effort and little money. It fits into my meal prep routine and grocery budget. I often use left over ingredients for a variety of my other recipes, so it isn’t going too far out of my normal eating habits. For so many of us, hydration and good athletic performance is so important in exercise. Personally, I have really struggled with having effective and steady workout routines. My MO has always been frail and so so tired after my workouts. All too frequently I was unmotivated to focus on my body and I have lived a very sedentary life. Exercise was a task and not an enjoyment, but I wanted to know what it felt like to push my body, feel energized, and in control of my coordination. Sound like you? Or maybe you are athletic but want to go further with your workouts. Feeling strong has always been out of my reach, and I didn’t accept that it was a fault of my own- there’s always the fact that we don’t know what we don’t know. During my journey in learning nutrition, I thought it would be helpful and important to understand a little about sports nutrition so that I can better assist people on a topic I haven’t fully experienced or understood in my own life. I always wanted to be an athlete, but never had the resources, health, motivation or confidence to try. I realized, after much contemplation that exercise needs to be an integral part of my healing, and I needed to start somewhere. While I have never yo-yo dieted, I have definitely been swinging on a pendulum with my exercise habits. I have never found a sustainable option for my efforts, and I have never achieved the level of strength and fitness I desire. I reached a point in my nutrition master’s program where I learned about biochemistry and how that plays a role in energy and physical activity. I had more questions, and I felt like I was looking into an abyss of information, misinformation from sports culture in the U.S. and not understanding my own abilities. It was evident then that I needed to take sports nutrition. What I learned was a few things: hydration and certain nutrients are often lacking in athletes. That includes B6, electrolytes, water and effective carbohydrate replenishment. Hold up- I have more questions; what about the difference between performance and recovery? And the fact that many athletes abuse their bodies and keep pushing (no pain no gain?) Common symptoms after pushing your body too hard shows wear in the muscle, performance plateau and digestive disturbances. I already have too much stress on my body, so.. how do I push myself without the mentality of no pain, no gain? I want little pain and I also want gains. This isn’t a have my cake and eat it too situation. Science is behind this, but sports nutrition research is vastly underdeveloped and too reliant on capitalist gains. Fermented foods have potential to support and uplift my exercise potential. I know from experience in having fermented foods, there are so many benefits (better GI health, less joint and muscle pain, and more energy)! What more can we find out about fermented foods and exercise? Fruits High in antioxidants: Fruits will provide sugars for proper fermentation as well as for carbohydrate replenishment. Vitamin C along with other antioxidants (fruits with dark purple coloring) will help in recovery by reducing free radical activity in the muscle. Wear and tear on the muscle can increase free radicals, so it is important to have detoxification activity for comfort and easier gains. Purple Sweet Potato: Sweets contain healthy carbohydrates (Huang, T., Zhou et al. 2015), B6 (among other B vitamins), Vitamin C, Potassium, anthocyanin (this antioxidant becomes more effective after fermentation (Wu, T., Tsai et al. 2011)), and a range of other nutrients. (Wholesome App. 2013). Coconut: Coconuts contain electrolytes, vitamin C, B vitamins, amino acids, phenolic contents, volatile acids, and sugars. In fermentation, acidity, amino acids, sugars and Vitamin C content declined (after 3 days, Vitamin C increased slightly then decreased again), but volatile acids and phenolic contents increased by fermentation (Xia, Q. et al. 2011). Furthermore, fermentation can improve the absorption level and effectiveness of antioxidants found in purple sweet potatoes (Wu, T., Tsai et al. 2011). In fermented coconuts, researchers found that vitamin C levels decreased, then increased after 3 days of fermentation (Xia, Q. et al. 2011), and then decreased again. Since my ferments are almost always fermented between 2-3 days, it is possible that we are able to increase activity of helpful antioxidants for maximum muscle detoxification and repair. You may be asking, can’t we just buy some supplements and call it a day? Evidence suggests that supplementation of nutrients is not known to be useful in improving exercise performance or recovery, and megadoses of nutrients like antioxidants (vitamin C) can be harmful (Maughan, R. J., & Murray, R. 2001). This is not to say that all supplements are useless in exercise: the statement simply says that, we do not have enough evidence to objectively know that athletes actually should and need to be taking supplements. In these statements, it is explained that we also know that nutrients like Vitamin C reduces muscle tearing and free radical activity in the muscle (Maughan, R. J., & Murray, R. 2001). Here’s the issue: we are saying that we know certain nutrients help athletes, but there’s little evidence to show that supplementation is actually useful. We do know, however, that research shows that supplementation of probiotics over 14 weeks can improve digestive disturbances and muscle recovery for high intensity trained athletes that experience gut inflammation (Lamprecht, M. 2012). Let’s go back for a second, because this is too confusing and I have more questions….How is it that there is little evidence about supplementation in sports nutrition, but yet there is evidence of usefulness for athletes to have certain nutrients? What about sports nutrition culture and the big push for supplementation? How is it that we know these nutrients can improve workouts, but we can’t be sure that supplementing them will actually help, and yet we still spend so much money on them? My aim is NOT to share my opinion, I have no judgement and I cannot possibly have any authority to host judgement over what a person needs or should do for their health. We all have different biochemistries, and my statements are here to point out relevant research. I want to encourage the experimentation of the potential behind whole food nutrition. Additional statements from researchers suggest that most athletes are healthy individuals without deficiencies or need to increase their nutrient intake (Maughan, R. J., & Murray, R. 2001). This is a claim based similarly as my original one- we don’t have enough evidence. So, just as it is said that supplements may not be useful, can we also say that, with lack of evidence, most athletes are in a physical state of not needing to improve their nutrition? If all athletes were physically capable at peak performance all the time, would they question the need to buy supplements? What we do know is that your body can recognize what whole food nutrients are from a biological and evolutionary standpoint. Furthermore, quality probiotic and antioxidant supplements are very expensive, especially for me, I have to choose how I spend my money very wisely. What we have in research, is solid evidence that fermented foods and whole food nutrients are beneficial in exercise and overall health. Even if a person has adequate levels of nutrients, there is no risk for harm done by incorporating whole food antioxidants and fermented foods like there is from incorporating supplemental nutrients. Each person and athlete has their own bioindividuality. Not one person has total understanding of their own biology, so experimenting with supplements without knowing their potential affects can seriously hinder the quality of athletic performance with symptoms like GI inflammation. 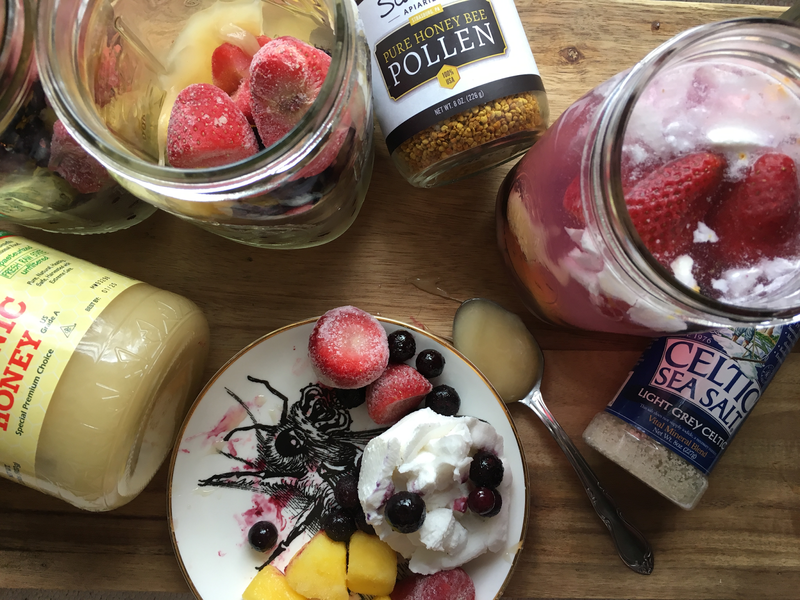 This recipe is very sustainable and thought out so that you can reduce the amount of glass you are buying and recycling from kombucha or other fermented probiotic drinks. The cost of honey, salt, fruit, coconut meat and purple sweet potatoes is low compared to buying a new bottled beverage each time. You need only a small amount of each ingredient to make this recipe, and it can reduce how much you spend on making sure you are getting beneficial nutrients in your diet. You can also modify this recipe after fermentation based on what you do know about your body and athletic performance. For example, I know that my workouts feel amazing if I add in a dose of calcium/magnesium powder along with an extra pinch of celtic grey sea salt. Magnesium is a supplement that I, personally, receive major benefits from by having trialled when my body was lacking. Introducing magnesium supplements into my routine was a suggestion from my nutritionist, it was not a self prescribed decision. I always encourage you to get a professional opinion before choosing supplements. If you do have have supplements that you KNOW pumps up your workout, or improves your hydration or recovery, by all means, add it in! Always read ingredients, research and ask your nutritionist whether or not the supplements and products you use are the absolute best for your body. You have one life, so your body deserves only the best forms of nutrition, so make sure your decisions are informed and backed by a professional. My research and curiosities to research and test this recipe were to try and improve my health through whole food nutrition. I want to continue testing this homemade probiotic sports drink with testimonials and further research as I think so many athletes and average people, like myself, deserve to feel only the best. Ferment for 2-3 days and store final product in the refrigerator for up to 2 weeks. Make sure your fruit, ball jar + lid are clean. Place your fruit, sweet potato, honey and salt in your jar. Fill the jar with the filtered water, leaving 1 inch of space at the top between the water and the lid. Close lid down tightly. Leave on counter at room temperature for 2-3 days. Burp the jars if necessary. Strain into another jar or container and fill your jar with fruit back up with water. Store both in the fridge. The fruit will ferment again- throw out the mixture when fruit is pale. Maughan, R. J., & Murray, R. (2001). Sports drinks basic science and practical aspects. Boca Raton, FL: CRC Press.